Fall is officially on it’s way! With the changing of seasons, comes a different way of decorating! The cooler temperatures and shorter days trigger a change in how I want my home to feel. For the cooler months, I just want my home to be cozy! And, I especially want a cozy bedroom for fall! Warm, comfortable snug! 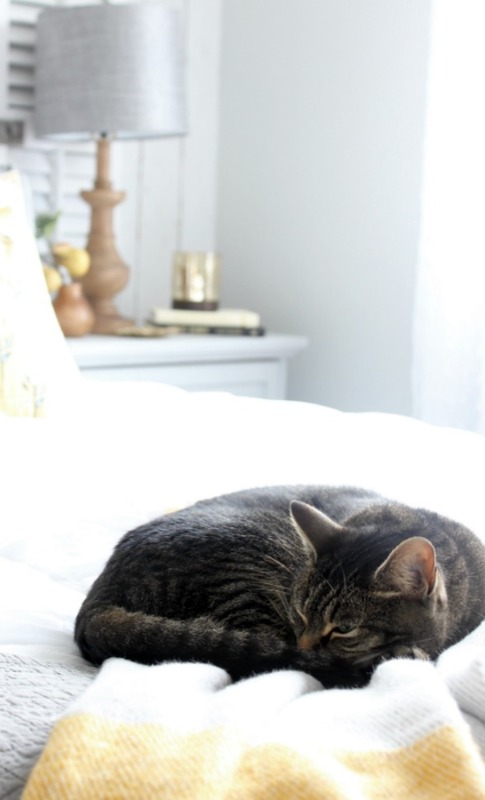 That’s how I want my bedroom to feel for fall and winter – “snug as a bug in a rug”. Now, I haven’t heard that in a long time and it’s actually kinda creepy if you think about it!!! So, how do we make a room cozy? I think there are some elements that are easy to add to any space that can bring out the cozy factor! First, a cozy throw blanket! 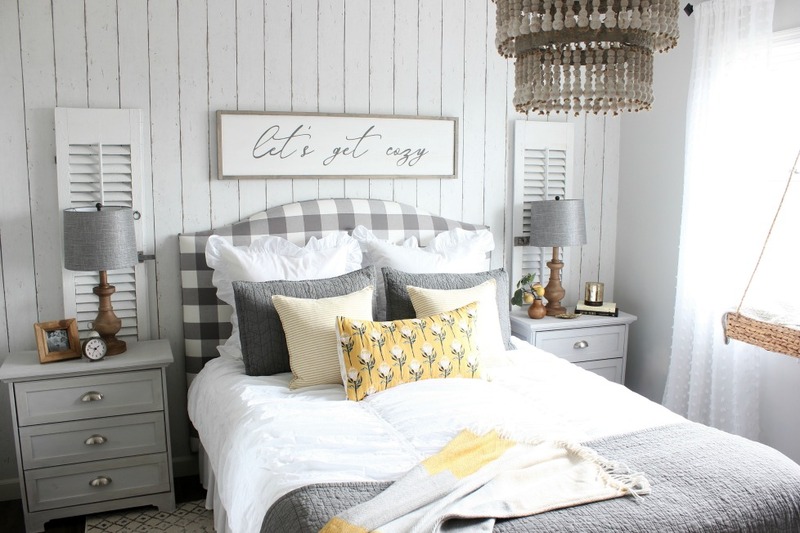 For my bedroom, I just wanted to add in some accents of mustard yellow to the existing gray and white. First I found this amazing color blocked throw at HomeGoods in all three colors! It has pretty fringe on the ends and the price was right at under $20! I love to shop at HomeGoods, TJ Maxx and Marshall’s because you can find great decor items at excellent prices! I like to have a throw at the end of my bed just in case head to this cozy spot during the day to read. I can snuggle up under a blanket without messing up the whole bed! I like lots of pillows! I think pillows make any space feel more cozy! However, I don’t like to add to my already huge collection of pillows, so I try to only purchase pillow covers or, better yet, make my own pillow covers. Once, I had the blanket in my cart, I browsed the pillow selection, but didn’t see anything I liked. So, I went to my favorite aisle in these stores, the table linens! I’ve shared before how I love to use table linen fabrics to make pillow covers and I found a set of gold and white ticking napkins that were 20″ x 20″ square – the perfect size for an accent pillow! The set of 6 cotton napkins was just $4.99! Now, you really can’t beat that for two pillows (and I could have made 3)! I have so many down and feather pillow forms, so making a pillow cover is a no brainer for me and I couldn’t be easier! Now that I had two subtle accent pillows with gold and white ticking, I knew I wanted a more bold patterned lumbar pillow to add to the bed. I didn’t see anything more at HomeGoods, so I headed over to Target. I found this pretty gold quilted pillow sham on clearance for $13.99! To make it fit my lumbar pillow form, I just turned it inside out and sewed new seams with my sewing machine. Then, cut away the excess. 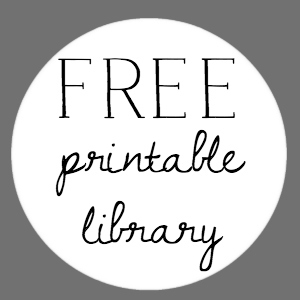 Sew simple!!! Sadie loves to be cozy in our bedroom and especially loves to sleep on whatever throw blanket is on the bed! Another element of cozy is lighting. I like to have sources of light that can be dimmed and candlelight is another way to make a space cozy! Just be careful with your candles!!! There are so many yummy candle scents for fall that can really make your space feel cozy and warm! 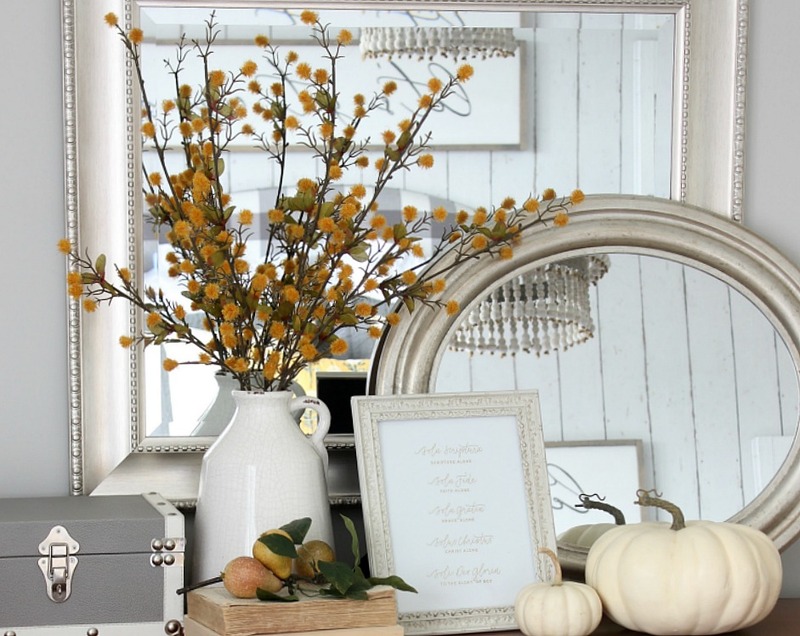 On our dresser, I brought in some more mustard yellow with these pretty branches I found at Michael’s . . .
and this faux golden pear branch from Pottery Barn (no longer available). 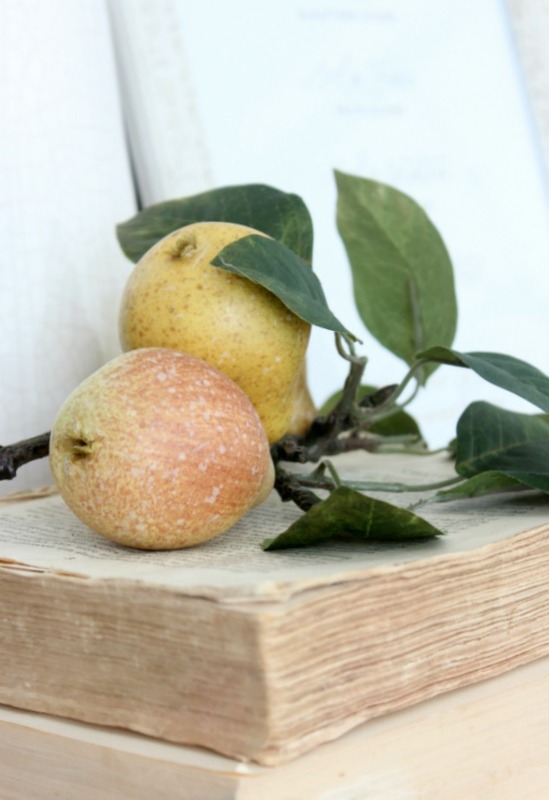 I used these pretty pears in two spots in the bedroom and that golden color really pops! 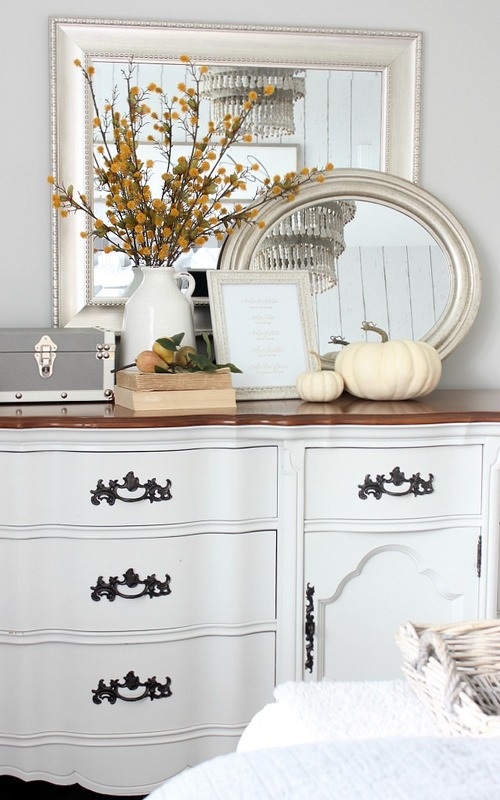 I also added a few white pumpkins – the larger one is faux and the smaller is real!!! And, you know I needed to change the sign above my bed to reflect this season of cozy! The “let’s get cozy” sign is available for sale in my Etsy shop HERE! I also brought in some warmer wood tones to the room. 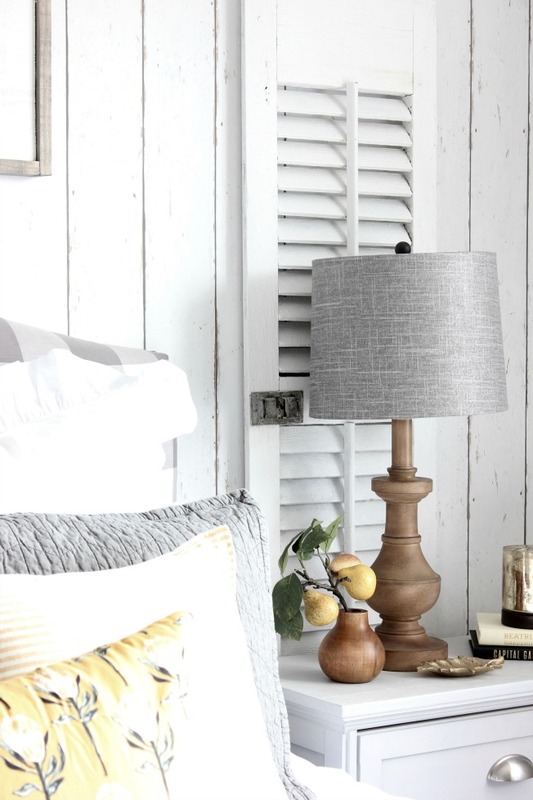 Warmer wood accents are coming back and replacing the cooler gray wood tones that we’ve been seeing so much of! And, I have to say that I’m loving them! So, that’s my cozy bedroom for fall! 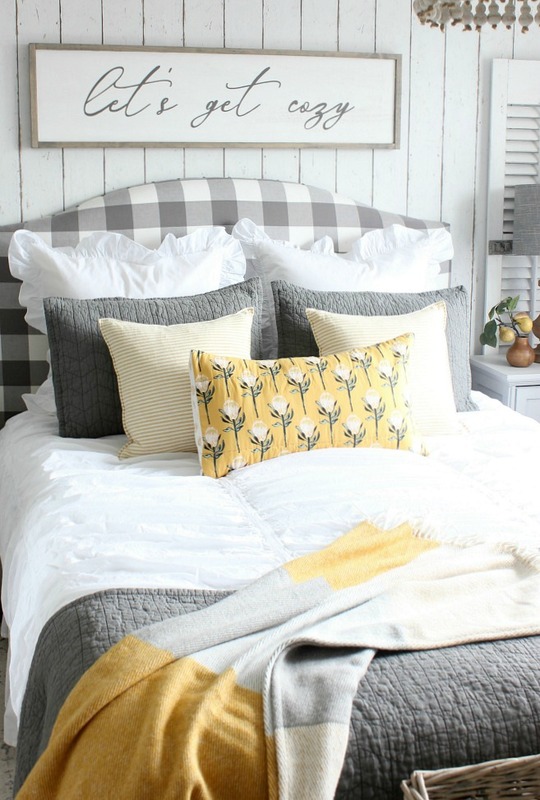 I hope I’ve given you a few ideas to make your own cozy bedroom for fall!!! Your bedroom looks fabulous, Doreen! Very cozy! Very cozy. What a lovely use of color. I have alot of gray in my house and the yellow is really growing on me. Thanks! I LOVE this beautiful use of gray and yellow gold. And your clever addition of the linens/pillows. Here’s my question…I see all of these lovely styled beds (like yours) and I ask…where are the pillows you actually use to sleep? Do you pull pillows out of covers every night, or stash the “real pillows” in the closet? Just curious!! So funny! I guess I’ve never shared this before! 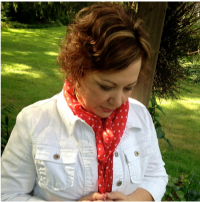 I have a vintage style laundry basket on wheels that sits in the corner beside the dresser. It really doesn’t show up much in my photos because of where it is. I store our sleeping pillows there when I make the bed – especially for a photo! And, when we go to bed, I put all of the decorative pillows in it! It’s pretty big and holds a lot of pillows!!! I’ve also used the basket in the past to hold a Christmas tree! It’s a great piece and I link to it in my SHOP MY HOME section in my header! Hope that explains where the sleep pillows are!!! I absolutely love your bedroom. I also have greys, whites and have just started adding some of the “wheat” colors. Did you purchase your headboard or did you do yourself? Very inviting bedroom. Great job. We actually made it ourselves! 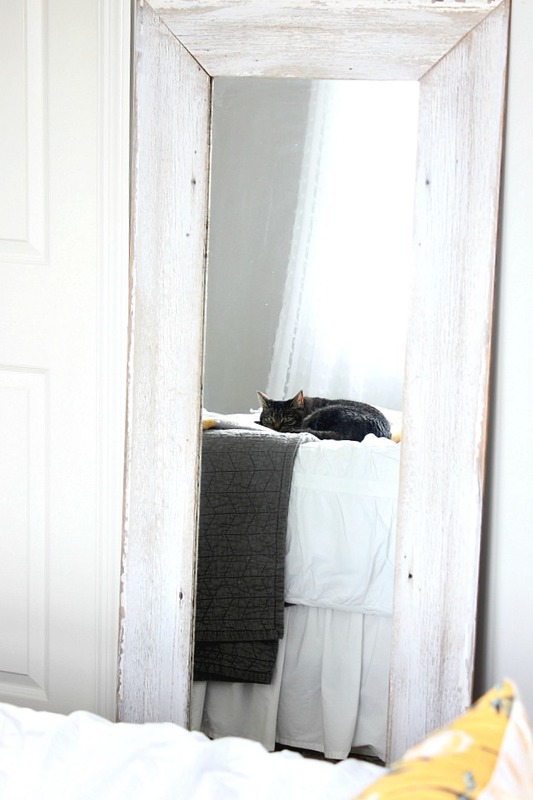 There is a tutorial on the blog – just search DIY headboard! How comfy .. cozy!! 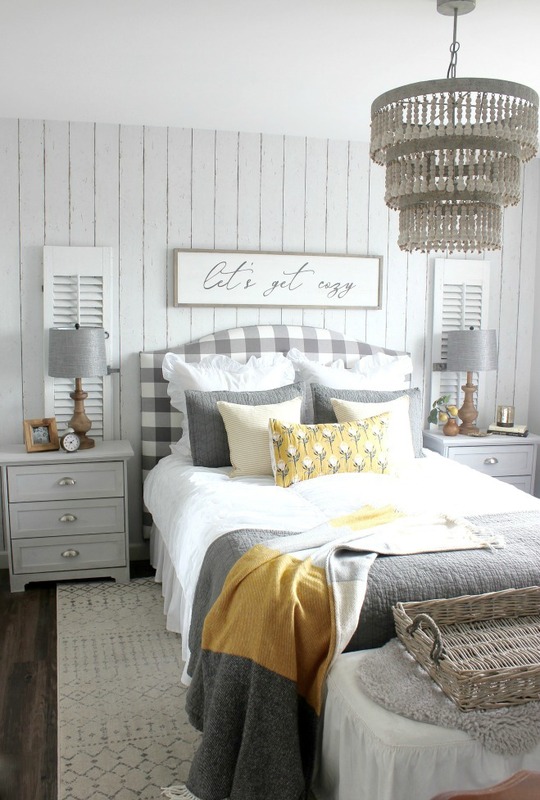 I love those colors together …..
Doreen, your room looks cozy and is beautifully designed. I would love to make a headboard so I went to your DIY section but couldn’t find it there. Should I be looking somewhere else? 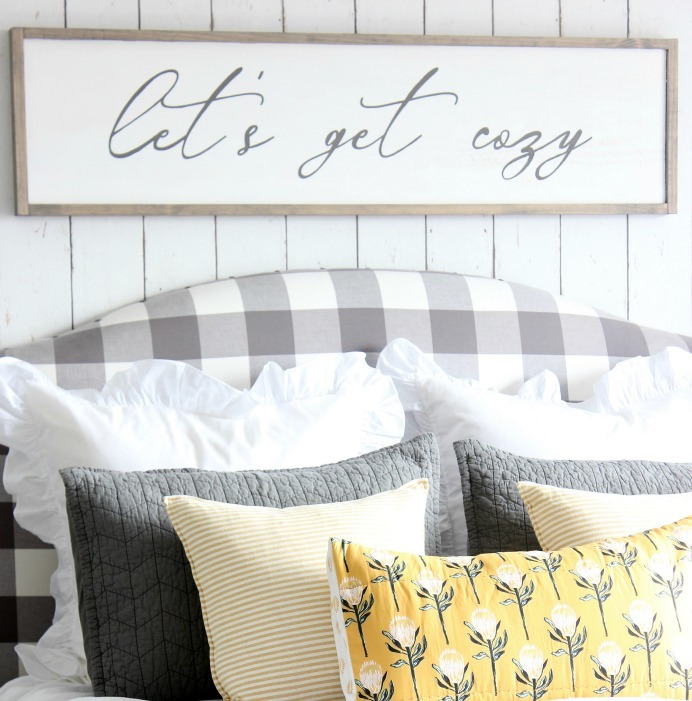 Bonnie, just type diy headboard into the search bar in my sidebar to find it! 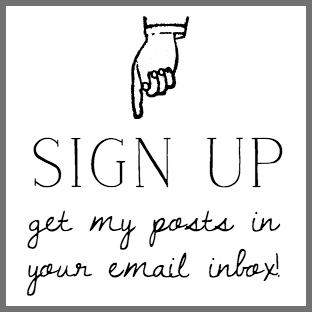 I’m still working on some blog updates that will send it to my DIY section. Pears, i know they aren’t real but they might tempt me for a snack if i woke in the middle of the night,lol! I love the pretty colors you have chosen and everything does look so very cozy and snug and you even have a foot warmer. Beautiful, I am in the progress of decorating my bedroom now for a total change over, I like the brighter colors, do you min dif I ask where did you get your lamps? It’s so bright and cheerful! I love the mix of colors you used! My latest favorite color is mustard yellow/gold also. That sounds so beautiful, Carrie! I love the addition of turquoise too!!! Very pretty, calming, comfortable and cozy! It’s a beautiful room and sounds like you did good on the budget to have the end result this nice! Every season your room gets a refresher. I like that. I’ve added the mustard gold to our gray, white and blues. Just a throw makes the room sunnier on gray days. I like your lamps too. Your dresser is decorated so pretty. I think you’re ready for autumn!! I like your bedroom but I love your cat Sadie even more!! She’s beautiful and makes me miss my sweet Alabaster. He looked a lot like her but with a little bit more white. I’m so sorry about Alabaster. Losing a pet is so hard! 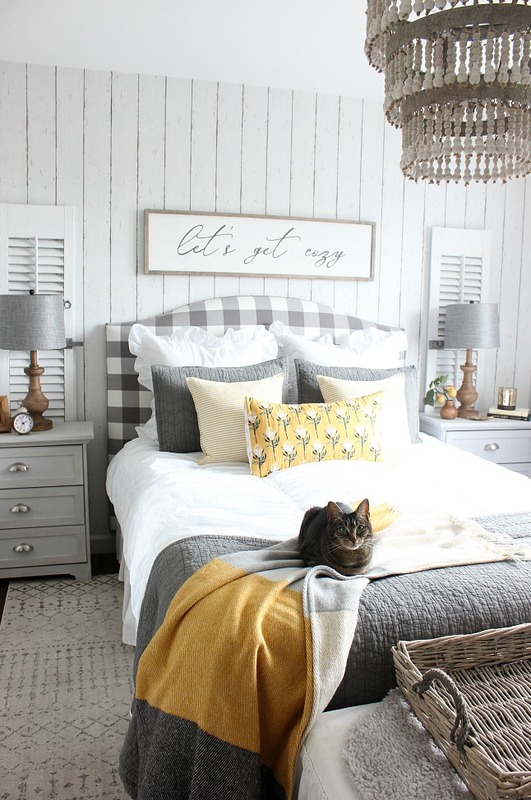 Hello…I love your bedroom style. Very inspiring. Where did you find your lamps? Hi, Linda. Thanks for your sweet comment. My lamps are from Walmart – I know, can you believe it!!! I did purchase different lampshades that I got at HomeGoods. I just checked and the lamps are no longer available. So sorry that I’m not much help.